luncheon about crisis communications. 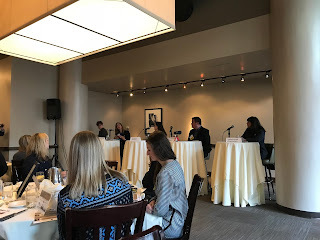 The panel of seasoned professionals provided many tips and insights from personal experience about surviving and navigating a crisis, and was a great reminder to dust off the crisis plan and be prepared for the next time you need it. The most important reminder for every company is to have a crisis communications plan. One panelist shared her stories of evacuating more than 2,000 individuals to safety during Hurricanes Irma and Maria, where she noted a plan is “a valuable starting point,” and an important roadmap to know and determine who does what. Not having a plan in place “only adds to the crisis,” mentioned one panelist who was called on to help with crisis communications following the Manchester Arena tragedy last summer. We counsel clients to have a detailed plan that includes employee procedures and protocols. This should be in place before a crisis occurs, so everyone knows his or her role. As with any plan, it is also important to remember to remain nimble. Plans change in the day-to-day, and this is extremely true during a crisis. Remaining calm under pressure is a feat – but can be invaluable. The third panelist, who also worked with the students during the hurricanes, shared how her team remained flexible and how that was beneficial in managing communications. “We brought members on the team who might not have been on there otherwise,” she said. While social media can sometimes seem like a deadly trap for negative news to go viral, it is a perfect platform for providing a quick response when you are ready to spread the word. All the panelists highlighted Twitter and Facebook for news sharing, and the importance of being active where the conversation was taking place. Following the hurricanes, it was especially important to find the individual private class year Facebook groups to reach the students. Social media is important for sharing news, and monitoring for updates – including from those affected directly by the crisis. It can also be a great tool to share a brief statement so media can easily find it, as was the case for those leading efforts after the Manchester arena tragedy. In the event of a crisis, the media will ask for a statement. While a speedy response may feel imperative, it is invaluable to provide accurate information. Trust yourselves, and the organization, to find the correct information before sharing something that might be inaccurate. As the media continue to ask for information through the duration of the crisis, it is valuable to stay in communication with them. Even if there are no new updates, keeping in touch can be a crucial tactic to maintain the lines of communication with reporters.